Relax on our balcony and enjoy the direct view of the beach that Southern Living Magazine voted #1 in the United States! 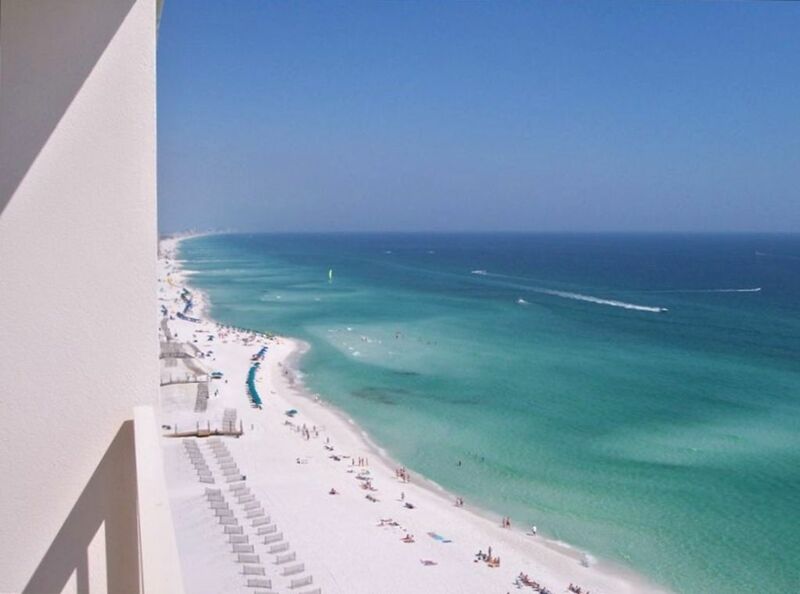 Located on the 18th floor, watch the dolphins play in the beautiful emerald waters of the Gulf of Mexico. Sunsets with the most vivid colors are especially memorable. This condo has been recently remodeled and updated with new 18' travertine-like tile, new carpet, new area rug, fresh paint, new queen sleeper sofa, new bedding and much more. We have not stopped there though - we are continuing to make upgrades and improvements to make your stay more pleasurable. There are three other condos available, two on the same floor and one that is one floor below if you have friends or family that would like to join you on your vacation. This condo has a keyless entry - no key to pick up or send back and forth, no key to worry about losing at the beach. Less hassle and saves time. The master bedroom is tastefully decorated and has a king-size bed for your comfort as well as a private bath. Two bunk beds in the hall, a new queen-size top grain leather, sleeper sofa and an additional full bathroom allow up to six people to sleep comfortably. Location is always key and Pelican Beach Resort is very conveniently located. The condo is right across the street from the Big Kahuna's water park, very close to shopping and numerous great restaurants as well as many other resort activities. This newly remodeled condo is a great value right in the heart of Destin! We are happy to have you as our guests! Below are our “House Rules” which we ask that you respect. Please take a minute to read them; ask us questions about any you don’t understand. Refrain from leaving your underage children unsupervised in the units or in the common areas of the property. Sleep in the same unit as your children to ensure they are properly supervised during your entire stay. Remember that only registered guests (no more than 6 in a 1 or 2 bedroom unit or 8 in a three bedroom unit) are permitted to stay in the rental units. One parent/guardian for every 3 children! Refrain from allowing children under the age of 15 years to use the fitness equipment; ages 15 – 18 may use facilities if accompanied by a parent or guardian. Use the trash chutes anytime, except between 10:00 PM and 7:00 AM. Bagged trash only! Do not hang towels and clothing on the balcony railings. Never under any circumstances feed birds from your balconies! Remember that excessive noise after 10:00 PM can result in your eviction and loss of deposits. Remember that the legal age for drinking alcoholic beverages in Florida is 21 years. Remember that adults who supply alcohol to minors can be arrested (fined and/or jailed) and evicted from the premises. Remember to display your parking pass on the dashboard at all times – only 2 vehicles per unit. Remember that your rental unit is someone else’s second home! You are responsible for any damage done while you rent the unit. Take care of it as you would your own home! A charge of $25 will be assessed for lost wristbands. No Smoking in the building, balconies or walkways. Smoking in these areas will result in eviction and $250.00 fine. We will have Full Security this year from March 1 - October 1. They will be at the entrance gate, around the pool, beach and be walking the property. ALL guest have to go to the lobby to received their wristbands. ALL guests including owners will be wearing wristbands from March 1 - October 1. Owners will be issued Neon Blue Silicone Wristbands to keep. Guests wear different color bands that will pertain to the week they are there. These bands are plastic throw away bands. Same ones we have used for years. With mandatory wristbands, Guest will only be issued up to 6 bands for 1 & 2 bedroom units. The 3 bedroom units at the Terrace will be issued as many as 8 wristbands. This is also a Fire Marshal restriction. ACCOMPANIED BY A PARENT OR ADULT GUARDIAN. These rules will be enforced. Beach Rules have not changed from last year. The rules will be enforced this year with regard to the first 3 rows along the water line. The first 3 rows will be reserved for the beach service and NO private chairs, umbrellas and cooler setups will be allowed in front of the Beach Service set ups. Parents are allowed to monitor their children and take their chairs and towels within the "20 foot rule" in front of the service for periods of time. Please inform your guest before they arrive what our rules are so they are not surprised when they get there. If your guest isn't aware of the Beach Rules, that alone will cause confusion, problems and your guest being disgruntled. Directly faces the beach, not on the side of the building, no roads to cross. Pelican Beach is a well maintained property. The condo was great, beautiful view of gulf ! Once again we enjoyed our stay in Destin in this Condo. It is a beautiful location with a view that is second to none. Dolphins are a common sight from this 18th floor perch. The Condo is clean, decorated nicely and has all the amenities of home. We truly feel we are at a second home when we stay here. My wife, daughter and I will return again soon (hopefully October) with our granddaughter. And we will again book through VRBO and Greg and Missy. This stay exceeded our expectations! The condo was gorgeous and the view breathtaking! The only issue I had was finding an available washer and dryer which I’m sure is always hard toward the end of a week! Would definitely stay here again! Wonderful stay the condo was great! The views from the balcony breathtaking and the dolphins put on a show everyday. We hope to be back next year. Only issue was smell when first arrived. Smelled like onions , possibly next door tenant cooking but did take 3 days to air out and a can of Lysol! Beautiful Ocean View and saw lots of Dolphins from our Balcony! Highly Recommend This Unit and Thankful to the Owners who shared it ! Recvd all condo information days before checking in and the Owners have Excellent taste ! Very nicely decorated, comfortable couch, bed and chairs. Love that Metal Elephant by the TV , please tell me where I can purchase one like it! Nice place with awesome views of the ocean.